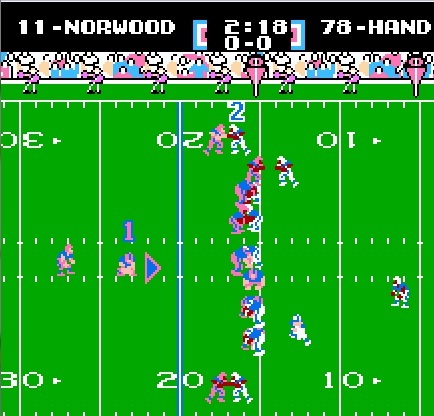 Tecmo Super Bowl kickers are like a car’s thermostat: you only notice when they don’t work. (Quick side note, anyone know how to fix a car’s thermostat? Asking for a friend.) Also like auto parts gone bad, most TSB kickers under-perform because they’re not being used correctly. The logic controlling TSB‘s special teams is self-evident. The higher a kicker’s “Kick Ability” rating, the farther and more precise their kicks. (Thanks for the update, Captain Obvious.) But the finer points of kicking deserve note, especially when many TSB tournament games come down to 4th-quarter Hail Marys and miracle kicks. Dave Brude, resident Nobel Laureate in Tecmo-ology, has dug the kicker calculation charts from the TSB rom. Bruddog, as he is known online, has previously unearthed the secrets of penalties and hidden songs from the TSB cart. Now he’s returned to the TecmoBowl.org forums to shed light on Tecmo’s most exciting players: kickers. For example, the arrow controlling a field goal/extra point kick has 29 discrete points. The following chart illustrates how those points interact with kick distance and a kicker’s rating. The numbers in each cell represent the modifier subtracted from a kicker’s accuracy in any given kick. The green areas are straight down the middle field goals. The yellow areas are kicks that deflect off the upright but still go in. The pink areas are doink-and-miss kicks, and the red areas are the appearances of everyone’s least-favorite dinosaur, the Shankasaurus Rex. Remember, the kick accuracy arrow only moves from hash mark to hash mark. Brude’s chart shows how much difference a few pixels make when kicking from greater differences. Another way to look at this data is to examine the percentage of good outcomes vs. distance and KA. Again, Brude has graphed out this precise relationship. Even though your cousin’s friend has said a million times he kicked an 80-yarder with the Dolphins, the chart suggests otherwise. The game’s best kicker, Chiefs K Nick Lowery, has a Kicking Ability of 81. This means you can reasonably expect him to hit from 60 or even 65. But 80? No way. The data shows an 80-yarder is the same as the one kid who swears that King Hippo will get up and burp and then fall down again in Punch-Out!! The other surprising bit of knowledge in these charts is that literally every TSB kicker can nail a 50-yarder. TSB‘s worst kicker, San Diego’s Mike Lansford, has a KA score of 19. A perfect Lansford boot, even from 51 yards, is a guaranteed three. Of course, catching a perfect Lansford kick is like locking eyes with a unicorn, but that’s another matter entirely. Kickers may not be the sexiest Tecmo players, but knowledge is power. In a 1-point 4th-quarter game, a Hail Mary is a coinflip at best. A 55-yard field goal, on the other hand, gives better odds at pulling down a W. Checking up on your kickers can prevent your Tecmo Super Bowl car from stalling out on the highway of Tournament Play. The post (Tecmo) Kickers are People, Too! appeared first on TECMO BOWLERS. "The other surprising bit of knowledge in these charts is that literally every TSB kicker can nail a 50-yarder." That should say 60 yards since the FG posts are a the back of the endzone in the NFL. So every kicker should be able to make a 60 yard FG. Since @segathonsov asked this on twitter this is the perfect FG arrow location... you want the arrow aligned with the holder regardless of what hashmark you are kicking from. Good piece of information. I've always wondered this. But in real life that would be known as a 60 YD FG since the posts are 10 yards behind the front of the endzone. Here is an updated one that is maybe less confusing. This is infinitely less confusing. Haha. I made the improper assumption too. Who fully reads anything any more? So do both of the kicker's attributes matter for calculating this?